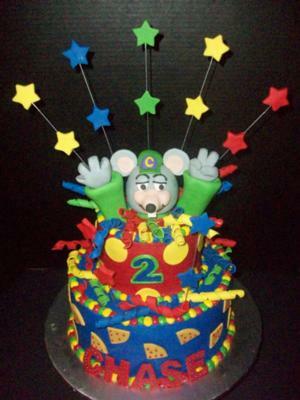 I made this Chuck E Cheese birthday cake for my son's 2nd birthday party, at where else - Chuck E. Cheese's!!! I sculpted the Chuck E Cheese head and arms completely of fondant a week before so it had time to dry. I inserted long popsicle sticks so they could stick on the cake without falling off. I also made the stars on floral wire and the curly ribbon all from fondant the week before. I baked a 6" 2 layer vanilla cake and a 10" 2 layer Devil's food chocolate cake. I made some homemade chocolate ganache while the cakes were baking and stuck it in the fridge for 2 hours while the cakes baked and cooled. The Devils food was filled with the chocolate ganache. I iced the bottom tier with buttercream icing tinted blue and the top with buttercream icing tinted red. I made little fondant pizza slices by tinting the fondant a orangeish color and cutting out with the large circle fondant cutter then cutting it into fourths to make 4 pizza slices. I took red fondant and cut tiny circles using the tip 5 to cut them out. I stuck the pizza slices all around the bottom tier. I cut out yellow fondant circles with the medium circle fondant cutter and stuck on the top tier. I printed out my son's name, Chase on the computer to get it as big as I wanted and cut out the letters to use as a pattern. I put the letters on some red fondant and used a craft knife to cut out the letters. Let dry for a few hours and sat them up against the bottom tier. I would recommend to do the letters a few days ahead of time, I wasn't planning on doing his name that way it was a last minute decision! I then just piped on border with different colored icing using tip 12 dots and stuck chuck e cheese in the top, the floral wire stars and curlies all around it. Great Job! How many people did it feed? I always have trouble figuring that part out! This is in no way an easy cake to make. You spent many hours on this and fondant is an advanced technique. Very colorful and cute, you did a very good job!